Apparently, I’m really into anti-aging hair care products right now even though I am 100% not in this product group’s targeted market. I love these products because they make your hair look freakin’ awesome regardless if your hair is in the “aging” category of things. I’ve been using the same hair smoothing serum for my dried hair since 2003. No joke. I’ve gone through about 2-3 bottles of it and keep coming back. So when a sample of this arrived in my Birchbox I didn’t think much of it until I actually tried it on my dried hair. 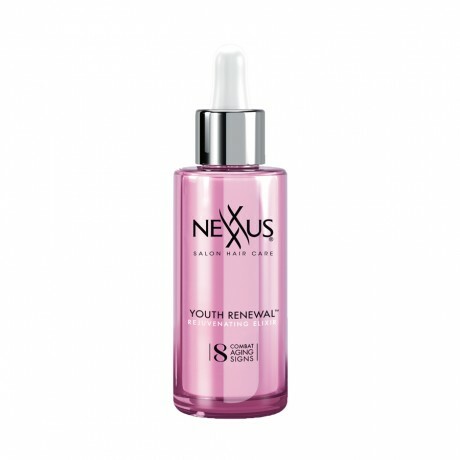 Nexxus® Youth Renewal™ Rejuvenating Elixir is basically instant awesome- insanely glossy locks, split end mending, super frizz free are how I would describe my hair after using this. Its super light and does not weigh my hair down at all, even if it put it at the crown. But the glossy-ness is reason enough to keep coming back. So insanely glossy, glossy like you just had it colored– that kind of glossy. After every blow out where I have used this serum my hair has looked pretty profesh- the other day after I blew out my hair I was like, “Damn, my hair looks goooooooood.” I don’t normally talk to myself, notice or exclaim anything about my hair, but it looked so good that I found myself talking to well, myself. Did I mention that I really really need a haircut too, by definition my hair should not look this good. You only need about four drops for long hair, and the bottle is about 1 oz so it will last for a while. Either way this is the second Nexxus product in the recent past that has blown me away and made my hair awesome. When did Nexxus start nailing it product wise– I feel like I was blind-sighted. Lastly, the scent of this stuff is particularly amazing. I can’t pinpoint what it is, which I know is my job here at the blog, but its fresh somewhat fruity and 100% delightful. Since I started using this in conjunction with this system, my hair, while before was pretty rad and I had no complaints, is even more healthy looking and glossy. Seriously, everyday is a good hair day.